Once upon a time I spent a girls’ weekend in Savannah, Georgia. My besties and I spent Saturday morning shopping down at the riverfront then stopped to have lunch. From there we planned to walk around the historic district a bit then drive down Tybee Island for a few hours. Then we planned to go back to the hotel for some R&R before treating ourselves to supper at a fancy-schmancy restaurant. But sometimes things just don’t play out like you’d planned. After I finished my lunch I went in search of the ladies room. There was a line so I was just sort of loitering in the bar area. Which was empty since it was noon. The bartender (who, in hindsight, I think was actually an evil leprechaun or crawled out of a rabbit’s hole) asked me if I’d ever sampled Savannah’s signature cocktail. Since A) I hadn’t, B) I like free sh!t and C) I’m drawn to booze like a moth to a flame, I perched on a bar stool and let him tell me about Chatham Artillery Punch. Then there was a time warp. And by my best approximation, twelve to fourteen hours passed. I remember only flashes but they include a lot of laughter (like, the head thrown back, gut-busting, table-slapping variety), crawling on cobble stones, a tattoo parlor, rap music, a voodoo mama, another tattoo parlor, a pistol, a hidden stone stairwell (or maybe that was just an alley), an Indian fortune teller and dancing. A lot of dancing. A bazillion years later I was trying to think of a theme for a party I wanted to have and I had a few flashbacks of the punch. I remembered that there was a giant crystal decanter behind the bar filled with a sort of reddish, cola-colored liquid and fermented looking cherries (like some sort of sour mash). I did a little research and found the story behind and recipe for Chatham Artillery Punch. As I understand it, the Chatham County Artillery was a military organization in service dating back to the late 1700’s. Having to entertain George Washington on short notice, the artillery members and their respective wives made punch from what they had on hand (fruit, wine, juices and liquor). 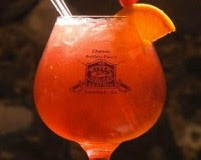 The punch was a hit and so was born Chatham Artillery Punch. If you’re looking for something to serve at a party (or theme like I was) Chatham Artillery Punch is great – especially since you have to make a bathtub full to make it! We had a “Savannah Garden Party” and I asked everyone to bring a bottle of champagne, which is what the cocktail is mixed with. Mix wine and next ten ingredients (through lemon juice) forty-eight hours before serving. Add one case of champagne when ready to serve. Serve over ice. I had koozies made up with this design as surcies for the party. We Southerners are nothing if not hospitable! Loved Savannah and can't wait for an excuse to invite enough people over to make this! I am going to become a Follower of your blog too! Everything looks delicious!! Gloria! Sorry for not responding sooner but I'm only just noticing your comments (sorry!). I hope you're still loving the South... I'm sure she would love you back! p.s. Actually, I'm following all of your boards on Pinterest and I can't wait to see what else you've pinned! I will check your other boards out when I get some time. May I say, you're hilarious, and you must be the life of the party. Thank you for this great story and recipe.